The dream is on the verge of reality. 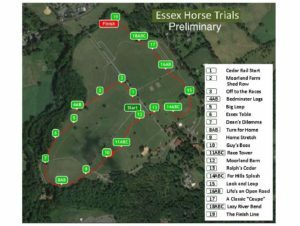 A cross-country course walk yesterday for supporters of the Mars Essex Horse Trials– being revived June 24 and 25 after an absence of 18 years– was an exciting reveal of handsome fences and the thought that went into them at Moorland Farm in Far Hills. Course designer Morgan Rowsell gave dozens of people, including former New Jersey Gov. Christie Whitman, a quick and insightful education about eventing. It’s fascinating how well he has utilized the terrain at the former Schley estate with its century-old turf. The venue is best known for the annual October Far Hills Steeplechase Race Meeting, chaired by Guy Torsilieri. 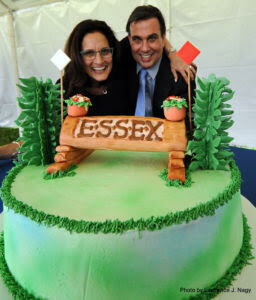 He is also a driving force behind the revival of Essex, whose organizing committee is co-chaired by Morgan and Ralph Jones. But it looks as if Moorland Farm will be as well-suited for eventing as it is for racing; the cross-country layout and obstacles are incredibly impressive. So is the prize money, $26,800, an eye-opener for the levels that will be competing. There are four tracks this year: Beginner Novice, Novice, Training and Preliminary. There are two sections for every division except Novice, which has two for Novice Rider and one for Open Novice. Everyone attending the party gamely trouped out onto the course, abandoning drinks, sliders and salads, to follow Morgan as he made the circuit of his route. We covered a lot of ground, and got a feel of what the horses have in store, though I hope they will be fitter than a lot of us were for such serious exercise. Join Morgan on the following video clips as he discusses the highlights of the course. 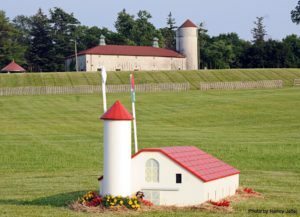 The first stop is by the landmark race announcer’s tower, where he explains 11 A, B and C, and the challenge of eventing on a steeplechase track. The fences are very clever. I particularly like number 12, the Moorland Barn, that’s between the tower and Ralph’s Cedar, number 13. Next we went to the water jump, 14ABC, the Far Hills Splash. Then we visited the huge trakehner fence, number 15, aptly named Look and Leap. After that it was 16AB, Life’s an Open Road, an oxer followed by a brush corner. We finished up our tour with 18ABC, the Lazy River Bend, a giant log that horses jump before heading downhill to a ditch and then turning toward a rolltop. Here’s a map of the preliminary course. If you want to come out to the horse trials, you can see dressage, cross-country and show jumping either day. Times may be subject to some change, but at the moment, plans call for Novice and Preliminary to be held on Saturday, with dressage starting at 9 a.m. and running until 2:25 p.m.; Novice show jumping goes from 11:30 a.m.-1:55 p.m.; cross-country for both levels from noon to 3:50 and Preliminary show jumping is set from 5:30-6:45 p.m.
On Sunday, dressage runs from 8:35 a.m. to 12:35 p.m. Cross-country is 10:45 a.m. to 2:45 p.m., with show jumping ending the day from 12:15-3 :55 p.m.
Tickets are $10 per person if you buy them at the Essex website, www.essexhorsetrials.org . They are good for two days. Tickets at the gate are $20. Kids 14 and under get in free. 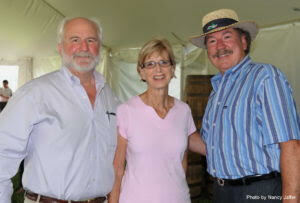 Non-equestrian attractions include activities for children, a classic car show, the vendor village and dining options.